After a thrilling league across the length and breadth of the country, the Three Ireland’s EStars Final took to the stage of Dublin’s 3Arena on Sunday, May 13th. With league toppers Shamrock Rovers facing off against close second Sligo Rovers, after both teams had dominated their semi-final clashes, months of practice and dedication finally paid off when Sligo Rovers took the trophy, the €20,000 prize pot and booked their passage for a trip to Las Vegas. It was an epic end to what had been a thrilling tour of gaming prowess, that kicked off in Dundalk two months previously. 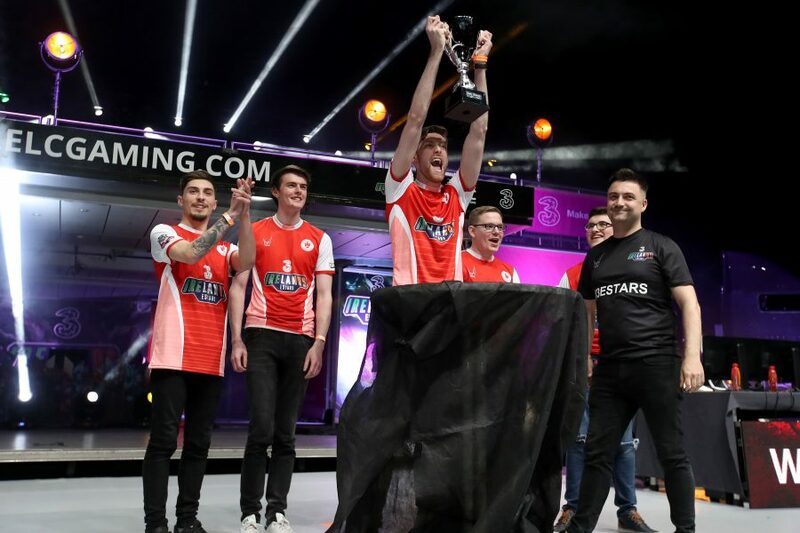 It started with a dream, to see esports on the stage of the 3Arena, a dream that began to take formation in Dundalk’s Oriel Park on March 14th. Ten teams, representing nine League of Ireland football clubs and main sponsors Three and composed of the country’s finest gaming talent, battling to earn their place at the Final. With twists and turns leaving six teams in contention up until the final night. Every win was crucial. Every loss was devastating. This is not a game. This was always so much more.. The event opened with DJ Luke O’Faolain setting the tone of the occasion, before presenters Connor Philips and Holly Hamilton invited the ‘Class of 2018’ finalists on stage, a massive production that included the mobile sports arena, Big Betty herself, led by percussion troupe, The Hit Machine Drummers. With that introduction, the finalists took their seats, facing out at a phenomenal crowd as they prepared to stake their claim to be crowned Three Ireland’s EStars. Having gone into the final as favourites following a blistering league campaign, despite dropping a game in the semi-final to Bray Wanderers, their first since their week one encounter, Shamrock Rovers were a formidable force. Ash “Auto Tank” McNamara, Daniel “Zoinkers” White, Luke “Doctor Yeti” Higgins, Adam “Adzie” Smails and Ray “Rayezor” Murphy had become a strong and cohesive unit across the league. Sligo Rovers also impressed throughout the league campaign, finishing slightly behind Shamrocks. Having dropped a couple of points earlier in the league, Sligo Rovers grew in confidence and capability and, having secured play-off position, made short work of Team Three in the semi-finals. Viktor “Keksius” Kudrickij, Johnny “Dragonship” Cummins, Kevin “Bluebullberry” Treanor, Robert “Deviilz” Cooney and Darren “Dakin” Hopkins were determined to take down Shamrocks after their defeat at their hands earlier in the campaign. While both teams had a cautious start, Sligo quickly gained control of the game to take apart Shamrocks, regaining bragging rights from their league clash and taking the all-important opening game. Result: Shamrock Rovers 0 Sligo Rovers 1. Result Shamrock Rovers 0 Sligo Rovers 2. The battle of the Rovers decided, streamers Sjin and Turps from the Yogscast and Rossboomsocks joined Nikita Buffee for a Q&A, including an impromptu visit on stage by Gross Gore, before dance sensations Prodijig gave a stunning performance to close the performances. All that remained, was for Sligo Rovers to take the stage one final time to receive the Three Ireland’s EStars trophy. Mags Byrne of Three Ireland’s EStars said that the Finals at the 3Arena had been a fitting finale to the ambitious and gripping league.